In the succession of food-fixation, one product eclipses them all: may we present Profiterole Chérie. A new spot dedicated to that dessert. 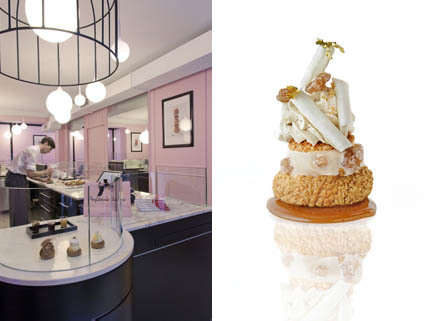 It is here that Philippe Urraca, winner of France’s Best Worker award, recreates his little treat, filling it with ice-cream…or, even better, pastry cream, à la traditional! Fantastically fresh, this profiterole is baked in 45 minutes and the “look” depends on the customer’s request. An entire professional team gets to work immediately, under the eyes of clients. The result is thus: an instant tasting, in a mini tea-salon, if you are one of those who can’t wait for your profiterole, or a take-away that you can eat at home…A choice of 10 different profiteroles. Profiterole Chérie, 17 rue Debelleyme Paris 3e.